"Being able to maintain mobility is a top priority for many older adults facing a hospital stay," said Heidi Wald, MD, MSPH, Vice President for Clinical Performance and Interim Vice President for Quality and Safety at SCL Health in Colorado and one of the lead authors on the AGS white paper. "So it's surprising that mobility still isn't a widely recognized outcome when we look at quality of care. With this new summary of research and recommendations, we hope will can move our health system toward assessing mobility more appropriately and ideally preventing mobility loss as we age." Yet while the loss of mobility is common as we age, AGS experts note that nothing is commonplace about the impact of this trend on overall well-being. "Mobility loss is critical in what we call the 'cascade' to dependence–a slippery slope that can start with small declines in movement but can ultimately lead to falls, further hospitalizations, and a general loss of independence," Dr. Wald observed. "Thankfully, there are ways we can prevent and perhaps even reverse that cascade–but that means doing more to assess and address mobility in a coordinated fashion." 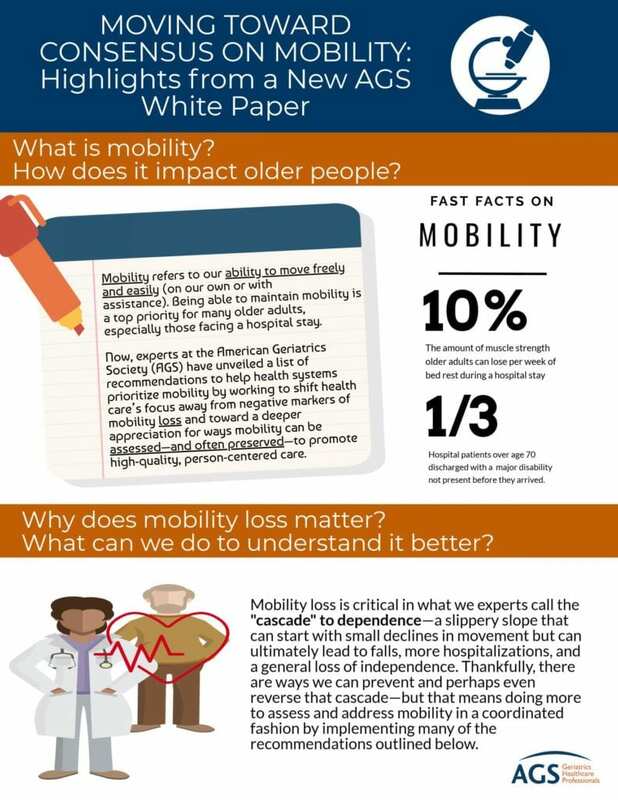 In their new white paper, representatives from the AGS Quality and Performance Measurement Committee reviewed existing research on mobility loss during hospitalization, including the implications of low mobility, the current state of mobility assessment, and ways we can use new and existing tools to promote routine evaluation of how well mobility is preserved following hospital stays. (1) While standardized programs across all hospitals may be difficult to develop, the AGS expert panel arrived at seven recommendations they believe leverage the best existing science in effective ways for the whole of our national health system. The AGS white paper, "The Case for Mobility Assessment in Hospitalized Older Adults" is available for free from JAGS at https://onlinelibrary.wiley.com/doi/full/10.1111/jgs.15595. Though being able to maintain mobility is a top priority for many older adults facing a hospital stay, mobility still is not a widely recognized outcome when we look at quality of care. Specific strategies identified by AGS experts for fostering greater attention to mobility assessment include (1) promoting its assessment in hospitals and health systems, (2) advocating for more mobility research funding, (3) developing consensus on mobility assessment standards, (4), working to minimize the burden of mobility assessment, (5) evaluating the feasibility of a mobility quality measure, (6) reframing the current regulatory focus on falls versus mobility, and (7) developing mobility-assessment resources to help healthcare providers. 1 Wald, H.E., Ramaswamy, R., Perskin, M.H., Roberts, L., Bogaisky, M., Suen, W., Mikhailovich, A., & Quality and Performance Measurement Committee of the American Geriatrics Society (AGS). (2018). The Care for Mobility Assessment in Hospitalized Older Adults: AGS White Paper Executive Summary. Journal of the American Geriatrics Society. Advanced online publication. DOI: 10.1111/jgs.15595.